Perhaps I would have considered Guess Who’s Coming to Dinner (1967) more interesting if I had been born in the beginning or middle of the 20th century instead of within its final 15 years. If it had not been for the engrossing manner in which Christina Drayton (played by Katharine Hepburn) wore scarves over the shoulder, I would have discontinued my viewing of the film. Abandoning involved knots and ties, Mrs. Drayton embraces simplicity by effortlessly hanging scarves over the shoulder like a sunbather might carry a beach towel en route to the water’s edge. 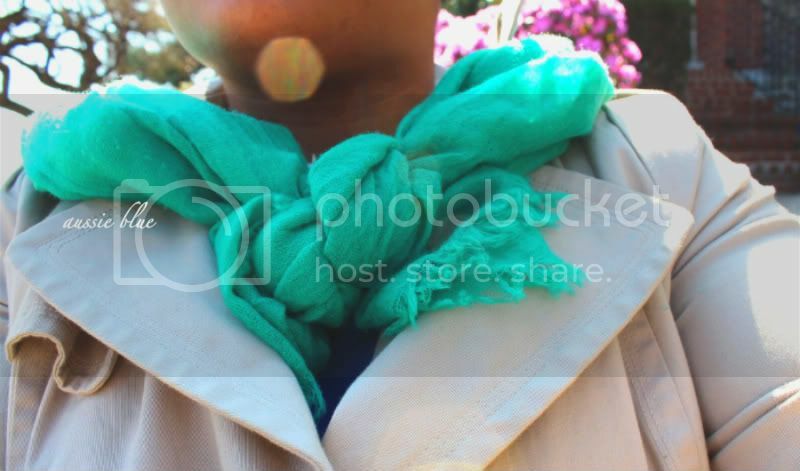 Straightaway I was inspired to update my trench coat with a vibrant scarf. To channel Mrs. Drayton pass your scarf through the shoulder strap of your trench and allow the excess to hang in front of your coat and at the back. I prefer to pass the scarf through both loops on each shoulder to create a cape-like effect at the trench's back. The free fabric in front may be tied into a knot at the neck (what I prefer) or draped in front of the shoulders like epaulettes. Nice photo. I like the color of this scarf. © 2017 Aussie Blue. All rights reserved.